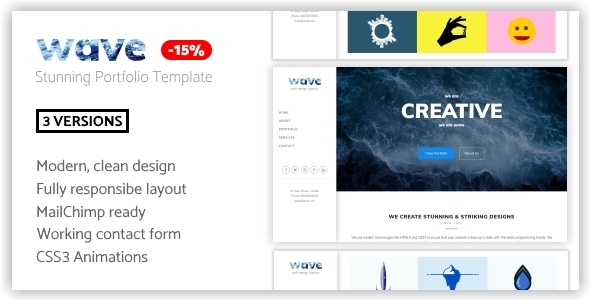 Wave is a multi-purpose, stunning and modern portfolio template. Carefully crafted for artists, fashion designers, graphic designers, website designers, freelancers, agencies (and more!) to show off their creations in a visually pleasing template. Showcase your projects and provide extra details in a full page project popup window. Wave allows you to engage with your customers with a working email contact form, as well as inform customers when you upload new work with a working MailChimp newsletter subscribe form (and step-by-step integration guide). Wave uses modern HTML5 and CSS3 technologies to create an engaging and up-to-date website. Wave uses minimal but elegant CSS3 and jQuery animations to ensure a contemporary feel. The fully responsive template adapts to computers, laptops, netbooks, tablets and modern smartphones. Scroll down for more information. 3 Versions Included: gradient background, image background and JS slideshow image background. CSS3 Fade In Animation: page fades in on load. Logo: add your own business logo. Unique Text Slider: title text slider. Retina Ready Icons: HD icons. Fade In and Out Reviews: jQuery fade in / out reviews. Project Popup Window: display extra information in a full screen project popup window. MailChimp Subscribe Form: easy-to-integrate MailChimp notify form. PHP Contact Form: email contact form. Responsive Layout: template adapts to computers, laptops, netbooks, tablets and modern smartphones. Google Fonts: easily change the font from Google’s huge selection of webfonts. Background images are provided by Pixabay under the Creative Commons Licence. They are not included within the purchase files. Services icons provided by Icons8 under the Creative Commons Attribution Licence.